This turned out SO GOOD. The sweetie man brought home bagged parsnips and I used the whole bag, which was one giant and two medium parsnips. Scrub and cut the parsnips into pieces. Wash and quarter the mushrooms. Toss the parsnip and mushroom pieces in a baking pan with olive oil, salt, and a little bit of thyme. Roast until nicely browned, about twenty minutes or maybe longer because of the mushrooms giving off liquid; so stir in the pecans just when the mushrooms start to look more roasted than steamed. Meanwhile, bring the quinoa and water to a boil in a small pot. Reduce heat to low and cook for 15 minutes. Turn off the heat and let it stand. 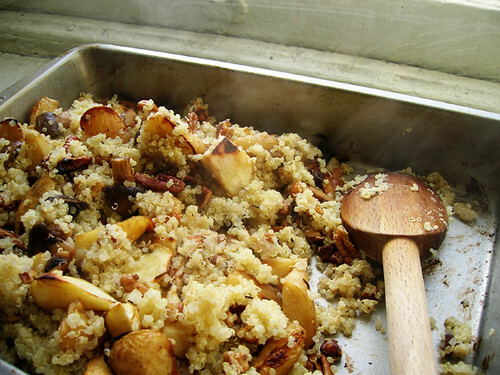 When the vegetables are roasted, add the quinoa right to the baking pan and stir it all together.